I read this article and found it very interesting, thought it might be something for you. The article is called “Waiting for the Irishman”: The Film to Watch Out For and is located at https://www.totallydublin.ie/film/waiting-for-the-irishman-the-film-to-watch-out-for/. You aren’t the only one who has been waiting eagerly for this much-anticipated film from Martin Scorsese. Waiting for the Irishman, a movie the audience is excited about will be directly released on Netflix. The extraordinary cast with Al Pacino, Joe Pesci, Robert De Niro and Harvey Keitel has left everybody dumbstruck. All Hollywood studios have been trying to get an opportunity for a movie with such unique cast and story. The man on the director’s chair has masterpieces like Taxi Driver and Godfellas to his credit. Such magnificent successes hint towards this movie is another blockbuster. The Irishman will be a biographical film, portraying the life of Frank Sheeran who was rumored to be an assassin for the Bufalino, crime family. The most interesting part is that he is rumored to have assassinated Jimmy Hoffa. Robert De Niro will play the role of Frank Sheeran while Al Pacino will portray Jimmy Hoffa on screen. A unique script with a mind-blowing cast will undoubtedly be unimaginably impressive. A perfect film has the right cast, right effort, an out of the box thinker-director and a somewhat real-life story. All of these things are blended intricately to have become The Irishman. Among the much-awaited films of the year, it deserves the excitement it has been receiving. Previously, the film was to be financed by the Hollywood powerhouse, Paramount Pictures. But probably the budget of almost $100 million frightened the firm. The director had to invest the money for real-location shootings and actors nut Paramount Pictures feared losing money. They thought the movie wouldn’t be able to make that much of money after its release. That was the moment when Netflix has taken over this huge project. It is a great opportunity for Netflix to prove to be an asset to quality entertainment. Also, Netflix will showcase the best cast and director combination through its medium. Netflix is already a huge success for its portrayal of a realistic and straightforward series. But showcasing a film that is sure to be a hit will add to the reputation of Netflix. It is Netflix through which the audience will see the coming together of such brilliant stars together on the silver screen. The movie is set to be released in 2019 with the exact date still not disclosed. 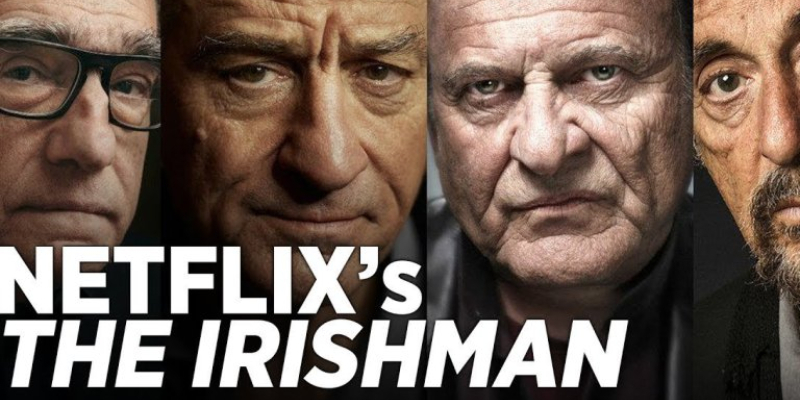 The Irishman is a gripping tale of crime and mystery with intense performances. The director is the master of successful movies has yet again surprised everyone with this movie. A tale of absolute realism, strength and darkness, it will be a must watch. Just a few months and Netflix will raise the curtains from the most awaited movie for 2019. Fans are excited to witness their most favorite stars together. Thriller will be on another level, and the movie will surely let everyone leave their seats out of excitement. The definition of excellence, this movie will have its name etched in golden letters after its release.